US Army Corps of Engineers Workbook. 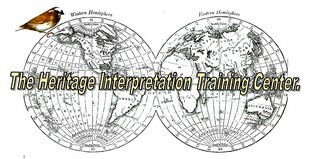 Sometimes one of the challenges for folks developing interpretive training or workshop manuals or interpreter program delivery reference (how-to reference manuals) is that they lack actual training themselves (college level) in teaching interpretation to others, or lack years of interpretive experience to pass on to others. This course will help you develop interactive hands on interpretive training workbook or manual full of practicum activities to help your participants learn what interpretive communications really is and how to teach it to others through creatuve practicum activities in your training workbook or manual. At the completion of this course you will have a professional interpretive training workshop manual/handbook, or an interpretive program and services reference (how-to) manual for your new or seasonal interpretive staff. In addition, we will provide you with numerous handouts, worksheets, checklists and other materials for you to include in your workshop manual/workbook or interpretive program/services manual. You can start this course at any time and complete this course at your own pace. Unit One - Introspective - What kind of manual do you need? A workshop manual with practicum activities or an interpretive reference manual for new staff to refer to on how to plan and deliver interpretive tours and programs? What are the objectives you want this manual to accomplish? Unit Two - Your proposed Schedule of Instruction. What do you plan to teach and how much time do you plan to spend on each topic? This will affect what teaching aides you will need for support materials for each workshop session. Sample "Schedules of Instructions" will be provided as examples. Unit Three - Time for Instructions. Think about the logistics of the workshop you'll be using the workshop manual or workbook for. Will this be a one day, two day or longer training experience that your course workbook will need materials for? Based on the length of your training, what activities will you be doing to illustrate good interpretive techniques and what kinds of workbook materials will you need for each lecture or practicum activity? Unit Four - Table of Contents. Based on your responses to the past Unit, let's develop your workbook or manual draft Table of Contents. What's in the workbook or manual and where? Sample workbook or manual table of contents will be provided as examples. Unit 5 - Let's do an inventory of what workbook or manual documents you have in hand for the manual and what workbook documents, handouts or worksheets you need to develop for each of the topics you will be presenting (via your Schedule of Instruction). Make your list of what you have and what you will need and send the list to the course instructor. Unit Six - Let's fill in the gaps and begin to create your training workbook/manual or your interpretive programming reference manual. Based on what you have or need, we will review it all and make recommendations for materials that will match your Schedule of Instruction. We will send you examples of training workbook handouts, practicum activities or interpretive check lists for you to use and modify for your own training. We will also make sure that workbook activities and practicums will match the amount of time you have allocated for each activity. Unit Seven - Put it all together. In this Unit you put everything you want into your draft workbook or manual, number the pages and finalize your Table of Contents. Make a PDF of the completed draft document and send it to the course instructor for a final review and comments. Unit Eight - This last unit is for you to think of any resource materials (text books, articles, etc.) that you would like to be made available for your team, and we will send you your Certificate of Completion (with CEU units). You'll have an excellent updated workbook or reference manual that you can add to or update as needed in the future. button below to pay by Pay Pal or Credit Card.